There is a panel in the 1980 comic book What If? #24, in which Marvel Comics' all seeing alien entity, The Watcher, solemnly intones to the reader, with reference to Spider-Man's failure to save her from death, that ‘Gwendolyn Stacy had a different destiny, one that irrevocably altered his own’. Now, even though this line is with reference to the story within that book (‘What If Spider-Man Had Saved Gwen Stacy?') it is a remarkable foreshadowing of what has come to pass 35 years on, as the destiny of Spider-Man's greatest lost love is, it seems, to currently overshadow him in both comic book sales and as a modern comic book icon and thus altering his position as the key figure in the so called Spider-Verse. Her re-introduction into comics (let's just forget the Gwen Clone fiasco…ok?) in Edge of Spider-Verse #2 last year, literally took, not only comic book fans, but the whole comic book business by surprise, with the book becoming one of the fastest selling and most sought after issues in recent comics history (and prices on the after market going through the roof). Marvel has reprinted the title four times (with a 5th printing coming in March), and, despite the fact that Gwen Stacy was reintroduced into an alternative Marvel Universe, Marvel had a bona fide hit on their hands and it was only a matter of time before her own ongoing series was announced. The art by Rodriguez compliments Latour's writing perfectly, it's modern and quirky and it actually gives the book a fluidity that is really refreshing to see, assisted by the vibrant colouring of Renzi (his colleague on the Vertigo book FBP). Every panel visually pops, making this one hell of a great looking comic book. It helps that the book is unburdened by being an origin story (that was taken care of in EoSV #2), making for a more pacy issue and allowing Latour to develop, and focus on, more of the lead character's personality. In Latour’s capable hands Gwen is confirmed as a genuinely contemporary and unique voice in comics and her undoubted appeal to younger readers is underlined and enforced through the leitmotifs of rebellion, humour and teen angst. One of the most interesting aspects of the alternative universe in which the book is set, is its twisting, or subversion, of the original Spider-Man Mythos and its players. While in EoSV #2 we had Peter Parker as The Lizard, here we get an expansion of that coda with references as far apart as the Yancy Street Gang from the original Fantastic Four comics and even Breaking Bad from our own recent popular culture. Make no mistake, this book is this trio's baby and its success right now certainly seems determined by how long Marvel keep them together on it. 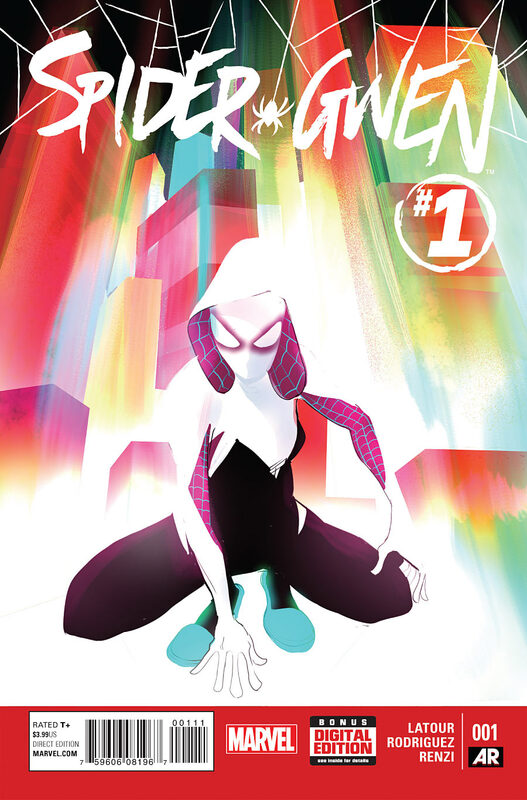 The immediate future looks very bright for Spider-Gwen (”don't fight the name if the name fits” as The Mary Janes sing!) but it will be interesting to see if Marvel will resist the temptation to integrate her into the fully fledged Marvel Universe or give Latour and company the time to build something more substantial around her alternative world. On the whole, a very pleasant surprise of a book. As Chuck D once said…”Don't believe the hype”…just pick up a copy, crack open a beer, stick the new Sleater Kinney album on and read it and accept it for what it is…a great, modern comic book. Great review!!! Very impressed with your breakdown. I really liked the book as well. Keep it up!!! Nice. I would probably switch up the soundtrack, but other than that you give sound advice when it comes to reading this book. Finally read this issue. Love the artwork, loving the colors on this one. The story is good, not bad. Looking forward to issue 2. Not a bad first issue, but I wasn’t wow’ed either.